Hi Noreen, as usual a lovely technique to learn! I have always wanted to use a tambour hook, and I crochet, so I thought it could not be so hard! Yet I have two left thumbs when I come to do it, lol! I need to study your video to get the hand positions right. A video like yours is worth volumes of instructions. Thank you! Keep up the good work, you are an inspiration! BTW, your first link to stitchred.com does not work. Thank you so much! Tambour crochet is a wonderful technique that I have been using for a long time, and it struck me that I really ought to share my delight with it! Thanks for the heads up on the broken link. I have fixed it and hope that the fix sticks! 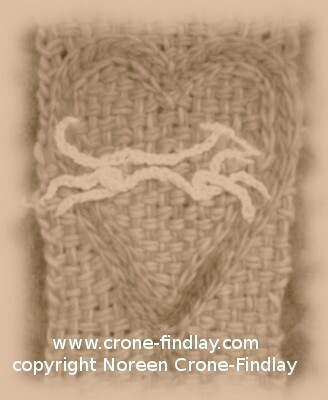 I also edited the pic of my greyhound memorial piece into this post, as this is how I did the embroidery for that piece. I enjoyed this very informative tutorial, Noreen. How do you allow for potential draw-in of the fabric (after washing the triangle) due to different tensions and possible different fiber content/gauges of the woven “canvas” of the triangle and the crocheted outline? Would you block each crocheted motif? Great question, Jan! Thanks for bringing it up! Yes, indeed, blocking is our friend! Also, working with a fairly loose tension when doing the tambour crochet will help to alieviate intense draw in. I had never heard of this type of crochet before but what a fast easy way to add something special to the weaving. I love tambour crochet. Nice video. Very sorry about your greyhound.